The topic of CEO compensation is popular in the business press and the subject of significant media coverage as the annual studies are released to the market. Few tears are shed for the earning power of the top executives of major publicly-traded corporations: the firms where data is visible and reliably reported in shareholder and related documentation. In many cases, the scale of the largesse received by these visible executives is difficult for the typical worker to relate to. In one study, it was reported that the then-CEO of Walmart, Michael Duke, earned by 8:30 a.m. on the first of January as much as the average worker in his company earned for the entire year. Reports of some of the cosmically large compensation packages of top executives are met with outrage by groups, who view this income inequality issue as one of society's ailments. The purpose of this article is to look at the issue from multiple perspectives: you are free to draw your own conclusion on whether CEO compensation is appropriate or excessive. As reported in Bloomberg BusinessWeek, the average CEO of a major corporation made 42 times the average hourly worker's pay in 1980. By 1990, that had almost doubled to 85 times. In 2000, the average CEO salary reached an unbelievable 531 times that of the average hourly worker. In 1965, CEOs earned on average 20-times the average employee. By 1978, CEOs earned just less than 30 times the average worker. In 1989, the divergence grew to 59 times and by 1995 it was almost 72 times. By 2014, the EPI suggested that the ratio was 313 times the average worker compensation. Of course, data and metrics have the potential to paint the picture you want to paint. In an alternative view, the U.S. Bureau of Labor Statistics defines the role of top executive much more broadly and reports a ratio of just 3.8 times the average worker's compensation in their much larger reporting sample. Regardless of source and definition, there is little doubt those who occupy the top role in our largest organizations are highly compensated, often at levels unimaginable to the rest of us. A key question is, of course, why? Bonuses paid for achieving targets in growth, revenues, earnings and other measures as established by the board of directors. Restricted stock grants or stock option grants that become valuable if and when the firm's share price rises to a targeted level. Deferred compensation, retirement benefits, and the contingent golden parachute should the individual be terminated. Expense accounts, the use of corporate assets including a corporate jet for travel. 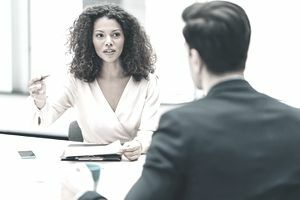 The top executive of any organization is ultimately accountable for ensuring the development and deployment of a strategy intended to achieve stakeholder objectives. Shareholders want profitable growth and an ever-increasing share price and possibly an ongoing and growing stream of dividend payments. Employees want an environment that offers rewarding work, some security and the ability to gain new skills and grow in their careers. Other stakeholders are concerned about fair and ethical practices in trade, foreign sourcing, and all other business dealings. The top executive is accountable to the board of directors for creating and sustaining a healthy, growing business. From top talent selection to strategy to ensuring the coordination and accountability of strategy execution, the internal work of the CEO is never-ending. From an external perspective, the CEO is the public face of the firm on a grand scale, representing the company in all of the media and mediums in use in our world. Much like star athletes, boards, shareholders, and employees put a premium on the potential impact of a visible executive they believe can promote and realize success. The star power can have a positive impact on the share price at the time of hiring and it may buy some time and acceptance of less than stellar results as the new CEO works to change the direction and strategy of the firm. Of course, the value question in CEO compensation is, "are they worth all of that money?" The answer is, maybe. Or maybe not. Given the visibility of CEO compensation to the external world, boards of directors are increasingly vigilant about protecting themselves and their firms from any aspersions of dereliction of duty. In many cases, CEO compensation is explicitly tied to results, especially growth in the share price. If the shareholders win, the CEO wins and, in theory, everyone is happy. In reality, the hard work of creating shareholder value is carried out by the hundreds, thousands or hundreds of thousands of workers in our largest organizations. One person, even the CEO, has little impact on the work performed. What she or he does is own the issue of what work will be performed. The setting of direction, selection of markets, approval of investments and work to ensure that the entire strategy execution process takes place with the synchronicity of a well-tuned symphony orchestra. The CEO does not do the work, however, she/he directly or indirectly impacts it based on decisions around talent, direction, and investment. During periods of poor performance and layoffs across the organization, and in the absence of a diligent board, high top executive compensation is deemed as outrageous by those impacted by the results. Shareholders appropriately rankle at high CEO compensation when​ the share price is sinking, and both the employees who lose their jobs and the employees who fear losing their jobs view high top executive compensation as offensive. Even nominal or more than nominal concessions by the board and top executives leave these individuals with compensation that seems laughably large to someone who lost their job. As mentioned above, you are free to draw your own conclusion on this topic. In some countries, the ratio of top executive compensation to median worker pay is constrained by culture and a sense of duty. In others, it is viewed as a free market scenario and the price of a star CEO matches the pricing of star athletes. If you believe the practices are unfair, find ways as a shareholder to let your concerns be heard. Support the election of activist board members who will work on your behalf. Make noise at annual shareholder meetings or via your right to free speech. Ultimately, you can choose to vote with your purchasing dollars and your feet by going elsewhere. This is a challenging and controversial issue with no easy resolution for many situations.